The TGA Breeze offers excellent comfort and stability making it perfect for everyday activities. Price excluding VAT.(Incl. VAT £5,994) *VAT Relief available on this product. The Breeze S4 provides first-class performance, comfort, and style. 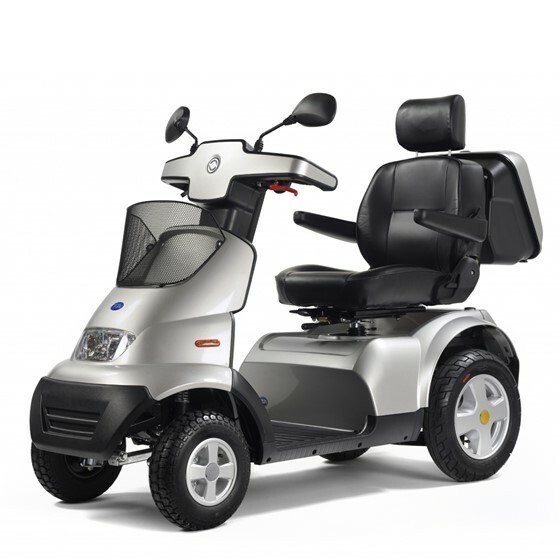 In fact, it has been a popular mobility scooter with our customers for many years. A main feature of the Breeze S4 is suspension which can be fully adjusted to soak up any bumps and uneven terrain. The motorcycle style engineering provides you with unrivalled stability, allowing users weighing up to 31 stone (200kg), to enjoy the Breeze S4 on all terrains. The large wheels and pneumatic tyres help to provide a decent ground clearance, making kerbs and bumpy terrain easy to navigate. The supportive seat is fully adjustable and can be rotated to make getting on and off the scooter easy. And to get that optimum seating position, just re-position the tiller to easily access those easy to use controls. The bright LED lights on the front and rear ensure that you can see and be seen in darker conditions while the energy absorbing bumpers are there for that extra bit of safety. And just in case you’re wondering about storage, you’ll be glad to know that there’s a lockable rear box for your shopping and a front basket to store personal items. As standard, the Breeze S4 has a range of up to 30 miles (48km), but if you do want to travel further, the battery and charger can be upgraded. A GT upgrade includes wider rear wheels and tyres for extra traction, perfect if you want to get back on the golf course! The Breeze S range of mobility scooters also includes a 3-wheeled version called the Breeze S3.